Siegfried “Wumm” Schnell was born on 23 January 1916 at Zielenzig in Mark Brandenburg. He joined the Luftwaffe in 1936. At the beginning of World War 2, Feldwebel Schnell was serving with 4./JG 2. On 14 May 1940, he scored his first victory, a French Bloch 152 fighter. He also participated in the Battle of Britain.  Leutnant Schnell was awarded the Ritterkreuz on 9 November for 20 victories. On 24 June 1941, he was transfered as Staffelkapitän to 9./JG 2. On 8 July he shot down three Spitfires to achieve his 40th victory and was awarded the Eichenlaub (No. 18). He was at this time one of the highest scoring aces of JG 2. On 19 August 1942, over Dieppe he destroyed five Spitfires to reach his 70th victory. Schnell reached his 80th victory on 4 April 1943. 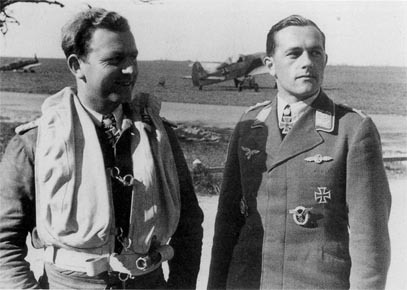 Geschwader Kommodore JG 2 Maj. Walter Oesau (127 victories, RK-S) and Staffelkapitän 9./JG 2 Hptm. Siegfried Schnell. 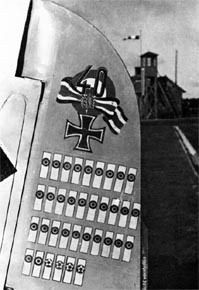 Left: seventy-five victories are displayed on the rudder of Schnell`s Focke Wulf 190A (last four bars show USAAF aircrafts, of which at least two were four-engined bombers), 18 February 1943, Vannes in France. 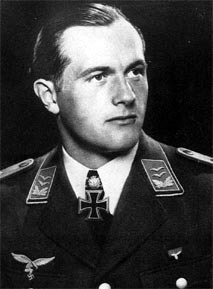 On 1 May 1944, Schnell was appointed Gruppenkommandeur of III./JG 54. On 11 January 1944, he downed three B-17s to reach 90 victories. On 11 February, he was transfered to IV./JG 54 which was based on the Eastern Front. He shot down three Russian aircraft, but on 25 February 1944 over Narva he was shot down in Bf 109 G-6 (WNr. 411 675) and killed by a Soviet fighter. “Wumm” Schnell flew about 500 missions during which he scored a total of 93 victories. 90 of these were scored on the Western Front. His score also included 12 four-engined bombers. - USAAF A/c 9./JG 2 18.2.1943? - E/a 9./JG 2 or Stab III./JG 54?